For over 100 years, we have helped to shape and support the building and highway construction industries of Minnesota. Skill, responsibility and integrity are the tenets upon which AGC of Minnesota was founded and they continue to guide our organization today. We offer professional guidance and assessments of member safety programs, provide onsite safety inspections, develop and deliver contractor-specific safety courses and administer the Construction Health and Safety Excellence (CHASE) program. AGC of Minnesota represents the construction industry at the state, local and national level. We develop a legislative agenda, educate elected officials on construction industry trends and operations, testify at hearings, and monitor and participate in the rulemaking/regulatory process. AGC of Minnesota is a founding partner of the Building Jobs Coalition, administers joint MNDOT/AGC of Minnesota technical committees and administers a political action committee (PAC) and two independent expenditure committees. AGC of Minnesota manages two leadership programs. Supervisory Training Program (STP) is designed primarily for field staff and Leadership Blueprint is designed for emerging leaders in management positions. We produce an annual golf tournament, sporting clays tournament, regional member meetings, a recognition dinner and holiday reception. On behalf of our members, AGC of Minnesota negotiates 23 building trades and highway-heavy labor contracts and provides To-Be-Bound forms. 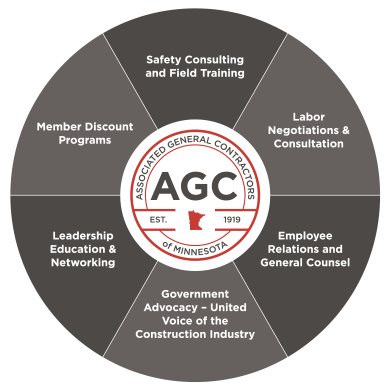 AGC of Minnesota facilitates grievance resolutions and job site conflicts, provides access to union agreements to AGC of Minnesota members only, appoint members to serve as employer trustees on fringe benefit plans and maintains a professional relationship with Minnesota construction trades representatives. AGC of Minnesota can assist members with employment law interpretations, discrimination and harassment claims, internal culture/policies/compliance issues, prevailing wage implementation, affirmative action implementation, dispute resolution and assistance with construction contracts and management. AGC of Minnesota offers members contract documents for building and highway subcontractors. The AGC of Minnesota partnership with National Purchasing Partners (NPP) provides discounts with national suppliers, such as Verizon, Sherwin Williams, Best Buy, Office Depot and more. Through AGC of America we provide discounts on vehicle purchases, fuel discounts and more. BirdDogHR powers the AGC of Minnesota career page by providing basic job opening listings at no cost to member firms. Dodge Analytics and AGC of Minnesota have partnered to offer a virtual plan room. Enterprise Fleet Management offers a variety of vehicle programs.